At Willoughby Design, we are empowered and encouraged to get involved in civic issues that are important to us. For me, Design for Democracy from the AIGA, the professional association for design provides this opportunity. 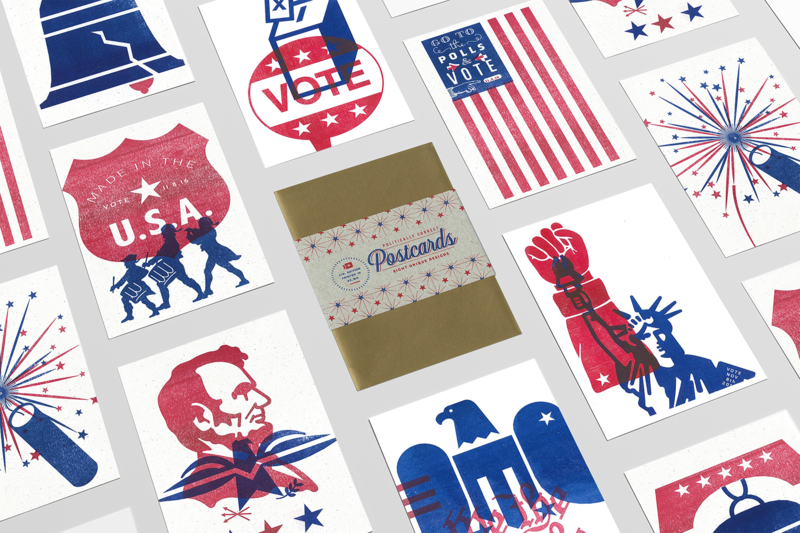 For the past year, I’ve used the political conversation currently happening in America as inspiration for both a contribution to Design for Democracy Get Out the Vote Initiative, as well as personal projects. It’s my way to further engage people in a constructive and meaningful discussion about the democratic process. My most ambitious project has been this 24-page self-published “risozine,” intended to open a dialogue about our democracy. It’s filled with illustrations and typography of impactful political quotes, past and present, to demonstrate why every vote matters. This self-published zine is printed on a Risograph printer with soy ink on recycled paper stock. 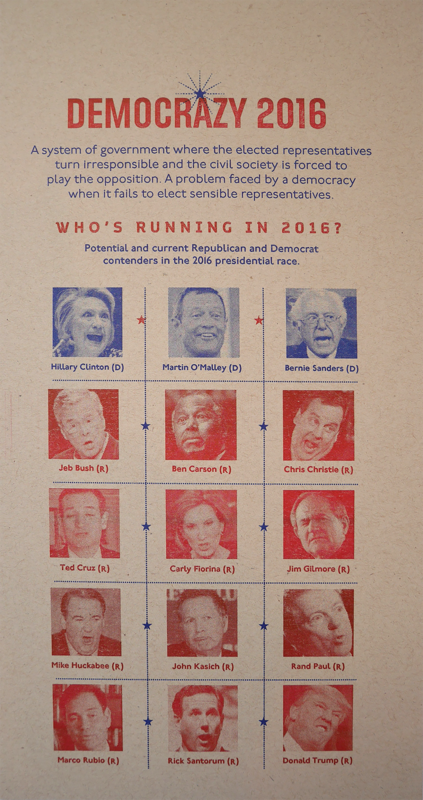 This Get Out The Vote 12-month calendar begins with the definition of the urban term, “Democrazy,” as well as images of the many, many 2016 Presidential contenders. Right off the bat it was a no-holds-barred race which spawned the idea to use the candidates “crazy faces” to show their enthusiasm, or perhaps their lunacy. 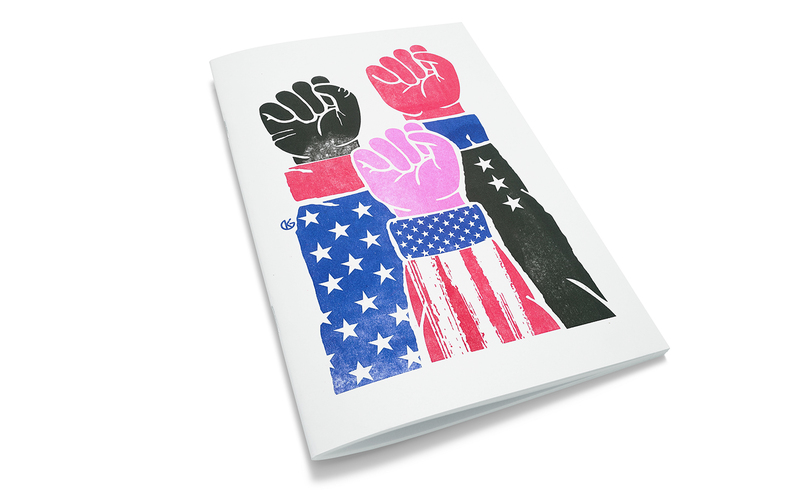 Iconic political imagery is reimagined in illustrations for a new look at the American spirit. This self-published calendar is printed on a Risograph printer with soy ink on recycled paper stock including French Paper™. 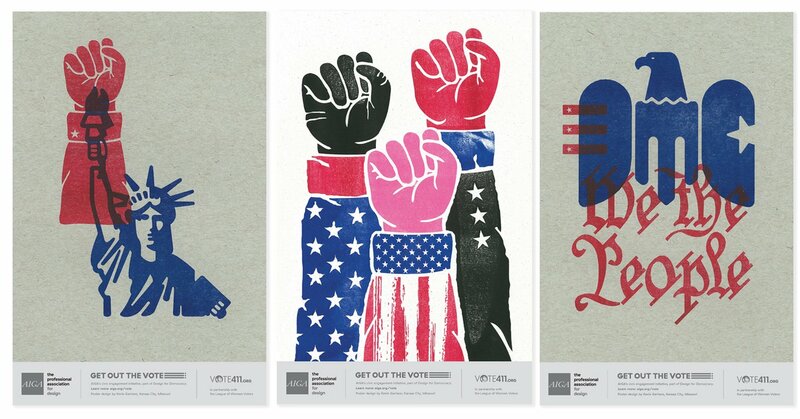 I’ve also contributed posters to the online exhibition, Get Out The Vote, found at aiga.org. You can see all the poster contributions by AIGA members, including Ann Willoughby, Founder & Chief Creative Officer, and AIGA 2014 Medalist, as well as Zack Shubkagel, Creative Director and Partner at Willoughby SF. Intended for use as debate and election watch party invitations, these “Politically Correct” postcards were created from overruns of the Democrazy Calendar. Printed on a Risograph printer with soy ink on recycled paper stock. I hope this series inspires you to register, get involved in your local community and ultimately, make your voice heard on November 8th, 2016 and VOTE! 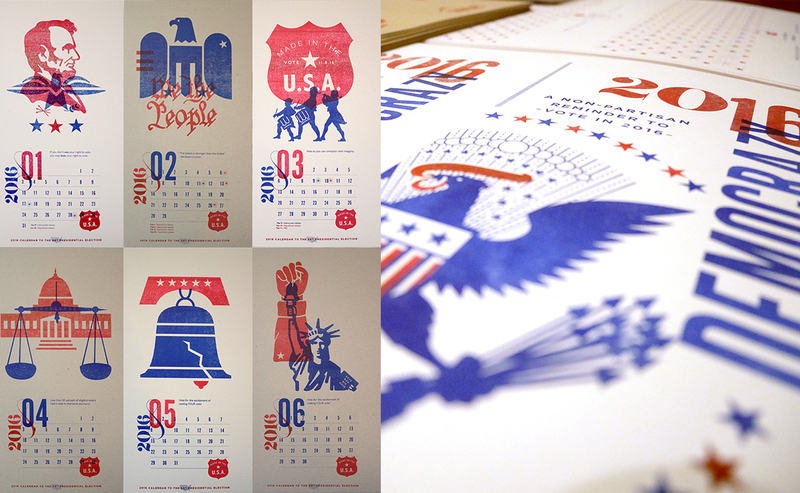 Design for Democracy has been an ongoing and wonderful collaboration with AIGA. 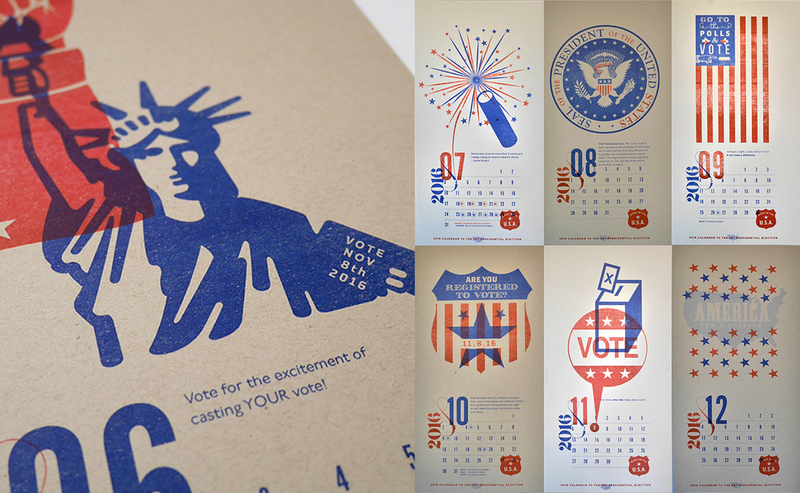 In 2011, we worked with the Secretary of the State of Kansas to create “A Guide For Effective Ballot Design.” In 2012, Zack Shubkagel, partner at Willoughby, served as National Chair for AIGA’s Get Out the Vote campaign, and curated exhibits of posters in Kansas City and at the National AIGA Offices in New York City.